Search for a word in the Visuwords visual dictionary and you are rewarded with an eye-popping image showing the relationship between your word and related words. Scroll to the bottom for the color code meanings. PowerSet isn’t even available yet but it is already getting attention for the promise of using natural language searching instead of keywords. Kosmix is a new player that offers instant sub-categories instead of just plain old search results. Currently offering a limited number of categories. Anoox encourages users to vote on the value and relevance of search engine results. Riya is a visual search engine. Instead of just searching keywords it will also search for images, or portions of images, that you upload. Google has updated its image search tool and has added some frivolous mouseover effects. In the old days (last week), you would clearly see basic info below each thumbnail. Now you must hover over the thumbnail to see details. You may like the cleaner look but hear me out. When you are searching for an images there are times when the details (size and source) do matter. Cleaner web design is great but not at the expense of useful information. To restore the “old” search you can follow these browser specific steps- click here. Yes, it is so easy to change information on Wikipedia. That’s why Microsoft agreed to pay a writer to “correct” some Wikipedia entries related to some Microsoft tech specs. This is against Wikipedia policy. The bottom line: maybe the entries are wrong. Maybe others are being paid to create entries that may be right or wrong? Trust me, this won’t happen with the folks at Encylopedia Brittanica. 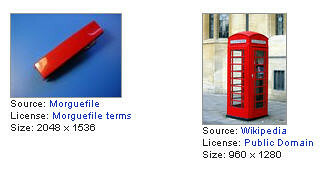 Yotophoto offers the usual image keyword search plus you can find copyright friendly images by color. Perfect for finding pix to match your web site’s color scheme.